Very Slender Vessels are in the first place developped for use by military and special forces. 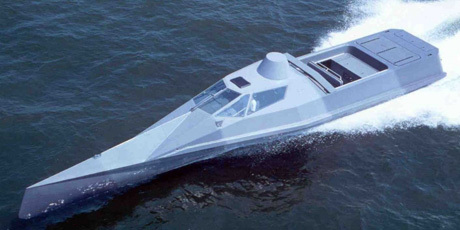 In 1999 the Special Boat Squadron, Britain’s marine special forces unit, acquired a VSV (Very Slender Vessel). 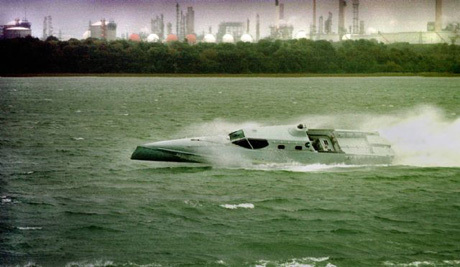 It can go faster than any other ocean-going fast pursuit vessel in the world. It is capable of speeds of more than 60 knots, is 53 feet long and cylindrical, with a 10 foot cross-section so it can punch straight through waves rather than go through the top of them. Traditional Deep’V’ hulls have two modes of operation, low speed displacement mode and a high speed planing mode. The VSVâ„¢ hull, by contrast, exhibits no discernible planing ‘hump’. The vessel can maintain any speed within its performance envelope returning full command to the skipper. 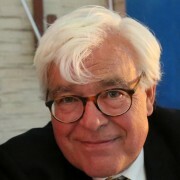 When traditional Deep ‘V’ boats travel at speed in rough conditions, they jump from wave to wave and land with high vertical acceleration or ‘g’ force. 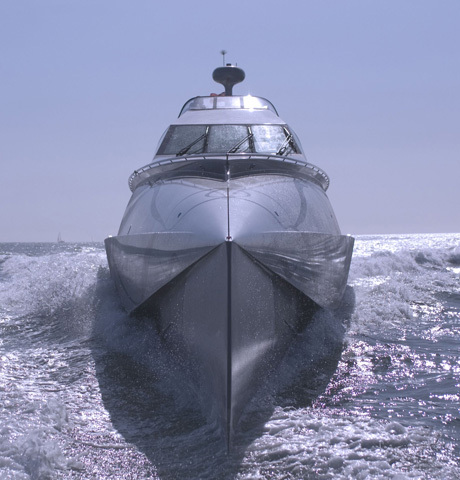 As the speed of the vessel increases or the sea gets rougher, the ‘g’ force on landing increases. Peak readings regularly exceed 20g which is sufficient to cause injury to the personnel and damage to the vessel and its equipment. Basically a VSV is a wave piercer. It is not completely novel as designers have been developing slim sharp fronted boats for years that are encouraged to cut through the waves rather than bouncing over them. The VSVâ„¢ applies these principles to high-speed patrol vessels. This has enabled crews to travel at high speeds in adverse sea conditions in relative comfort and safety. and is developping a 22 m version. 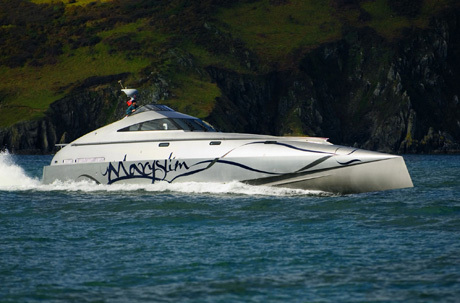 The Motor Boat & Yachting issue of July 2007 features the maiden trip of MarySlim, the first VSV that is built as a motor yacht and gives it a thumbs up especially as to the unexpected smoothness of riding the waves. Cruising speeds of 28 – 35 knots are fabulous in waves without having to re swallow your kidneys! The second photo shows clearly the difference with fast wave piercing motor yach designs thus far: They all have as a common factor the more or less trimaran form. The VSV has no outrigging parts. It only has very wide chines and a very high length : beam ratio. See for more information Multi Marine UK.